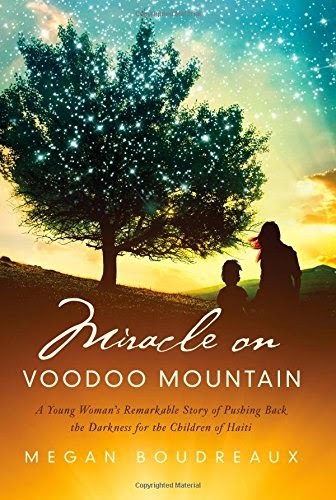 Behold & Reflect: Review of Megan Boudreaux's "Miracle on Voodoo Mountain"
Review of Megan Boudreaux's "Miracle on Voodoo Mountain"
The book's beautiful, haunting cover is not just a marketing tool. The image features a tamarind tree that is symbolic of so many of the miracles that happen in Megan's story. She dreams of the tree night after night, until realizing God is calling her to uproot to Gressier, the town where she first saw the tree on a business trip. Under the same tree, she meets a raggedy little slave girl, whom she later rescues and adopts. For years before the story begins, a local Haitian pastor and his wife met weekly under this tree to pray for a Christian to come and transform the mountain, which served as a mecca for Voodoo priests. The same tree can be seen today from the school and medical clinic that now occupy the land. Sometimes I just try to get through a book so I can review it and shelve it. I read Boudreaux's memoir in a day and have been re-reading parts of it in the days afterwards to savor the story. It's a true story of a real-life role model. Similar to Kisses from Katie author Katie Davis, Megan leaves a cushy life of cute outfits and bright futures to live without running water or electricity among the destitute of earthquake ravaged, voodoo entrenched Haiti. Megan follows God's leading with simplicity. I've been so moved by how the entire plot of this book hinges on Megan cultivating an awareness of God's moving and nudging and instructing in her spirit. She obeys simply again and again, and God keeps speaking to her. The result is a life full of miracles and restoration. It's full of meaningful miracles. I've never doubted that miracles do happen today, but I'm usually skeptical of supernatural claims because they often seem to serve no other purpose than to show off and puff up. Megan experiences the gift of tongues similar to the way the disciples did in the book of Acts: after weeks of struggling to communicate and making little progress in learning Haitian Creole, she suddenly understands and is able to speak it fluently. With this gift, she is able to really start changing the lives of the poor children she lives among. It confronts the heart with the reality of poverty and corruption. Megan is almost never preachy in this book. When she does take time to express her views, it's to expose the corruption that well-meaning American churches often fund in the form of sham orphanages. She also thinks critically about the ethics of adopting children with living parents, as two of her daughters have a living, but estranged father. Obviously, I'm moved by Megan's story and the story of Gressier. It makes my heart long to move abroad and live simply, hanging on the words of my Savior each moment. And it makes me also want to stay right where I am and hang on my Savior's words each moment. There are some loose ends to this story, which on a literary level was a slight detractor. However, I see the untied story lines as opportunities to pray for real people in tenuous situations. Hey can you make a children's book about George Mueller? What is a sham orphanage? I like your idea, Priscilla. A while ago I tried to find some good children's biographies of Christian missionaries... I found some, but didn't think the writing was that good. Maybe that should be my next project. There's an orphanage in the book that takes donations from several American churches, but then sells the stuff rather than give it to the children that live there. So, I guess the orphanage is real, but the director was extremely corrupt.